Stately villa of large size. The property comprises on the ground floor entrance hall, large living room, spacious kitchen, comfortable room with fireplace, bathroom, cellar, laundry room, garage and central heating. On the first floor three large bedrooms, two bathrooms, utility room and comfortable terrazze. I wooden porch with barbecue, ideal for al fresco dining, adjoins the garden. The whole area is recintata. L'abitazione, built in the mid-70s, is in good condition and no need for maintenance straordinaria. L'immobile is also equipped with solar panels to produce domestic hot water and the climatizzazione. 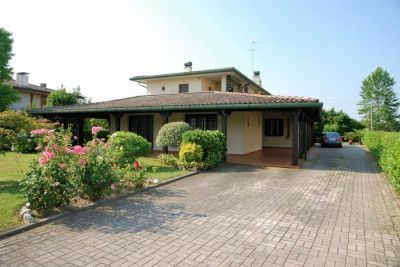 Un'ottima system solution for the family, even if numerous, a few steps from the town center and close to all major services.